This is part one of a three-part post on agriculture economic development. After the better part of a year working for Negros Women for Tomorrow Foundation (NWTF), a microfinance institution in the Philippines, I decided to head west again – specifically, to West Africa. In late 2010, I moved to Ghana to work with TechnoServe, a non-profit specializing in market-driven solutions to economic development. This is really just a fancy way of saying that TechnoServe recognizes the importance of competitive markets in creating jobs for people living on less than a few dollars a day. My mandate was a bit nebulous at first (and for the bulk of my time in Ghana). I was seconded to another organization – ACDI/VOCA – on a $30 million USAID project called ADVANCE (an acronym standing for Enhancing the Agriculture Chain in Ghana, or something like that). The project was a bit dysfunctional, having undergone substantial personnel changes when I arrived (the Chief of Party and Technical Advisor – the equivalent of the CEO and COO – either quit or were fired after being significantly at odds with one another over the direction of the project. The methodology of the project was something called “Market Facilitation,” a relatively new and trendy approach to catalyzing positive change in the agriculture sector. For a much more detailed overview of what it is, my good friend Mark Brown with Engineers Without Borders Canada has a great overview at his blog, Kulemela. But I will give the quick and dirty. In the past, most projects were unsuccessful because they were both short-sighted and unsustainable. They were short-sighted because the interventions focused on supply rather than demand. In other words, development agencies would provide fertilizer and tractors and other implements to improve yields for smallholder farmers. Yet, without simultaneously improving the infrastructure and building the market for the higher product volume, increased crop yields actually had the adverse affect of driving down prices, as there was nowhere to sell the surplus except for the same markets as before, which now had greater leverage in negotiation. And it was unsustainable because, once the funding for the project was complete, the gravy train would grind to a halt, and the tractors would sit in a garage somewhere – if they were lucky – broken-down and rusting away into oblivion. And a butterfly flaps its wings. The logical response to these failures was to focus not on the production side, but rather the markets. Work with the buyers to develop their capacity to handle greater volumes, and they, in turn, will invest in suppliers to handle increased demand. Assisting a maize aggregator (a term for the middleman buying and selling the product) to get a loan in order to purchase an tractor-mounted maize sheller (a device that removes the kernels from ears of corn) which not only create an alternative source of income for them, allowing them to buy more maize from more farmers, but it will also save time by eliminating manual shelling. This is an example of a win-win situation that benefits the entire market in a sustainable way. Market facilitation, specifically, tries to catalyze these connections. For example, on one side, a Swedish jatropha company in the northern part of Ghana has 40 tractors that it uses only during the planting and harvesting season, leaving them idle for the remainder of the year. On the other, a group of aggregators buying maize and soyabeans from more than 1,000 farmers needs tractors to prepare the lands for planting. Connecting these two entities in a mutually-beneficial business relationship creates a sustainable partnership, where the jatropha company earns additional income from maximizing utilization of its equipment, while the aggregators solve their tractor problem. 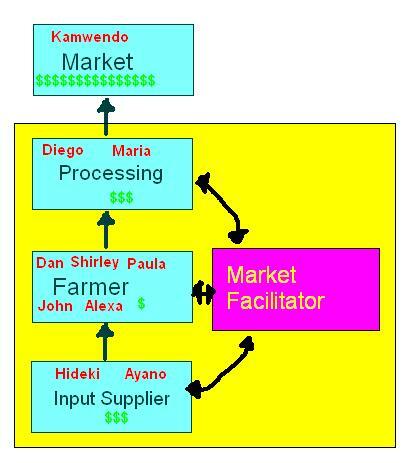 In another example, a large juice manufacturer needs a reliable source of pineapples, mangoes, and citrus to keep its factory running at full capacity, while groups of small- to medium-sized farmers have no market for their products, other than the local “market women” – the aggregators who purchase for domestic sale. By connecting the two groups, the juice manufacturer can establish lasting partnerships, supplying farmers with inputs in exchange for a guarantee of the final product at a fixed price. It is an elegant idea that works well in theory, but less so in practice. For one thing, relationships between buyers and sellers in these agriculture markets are notoriously plagued by years of mistrust. On this blog, I put up a guest post from Mark of EWB detailing this problem. The juice manufacturer says it needs twenty tons of pineapples, and then, when it comes time to purchase, scales back due to capital constraints and only buys ten tons, leaving the farmers with the remainder rotting on their farms. And, because of poor management, the manufacturer fails to pay the farmers for three months, leaving the farmers in the lurch. On the other side of the coin, the manufacturer provides fertilizer, seeds, and equipment to the farmers on credit in exchange for a guarantee of their products. But, come harvest time, the farmers find a better deal elsewhere and sell their crops to someone else, leaving the manufacturer out thousands of dollars and without produce for its factories. These are the realities of dealing in these markets. In the next post, I will explain my thoughts on market facilitation. Farmers must think about their profit, and manufacturers always think to dominate farmers. In my country the sugarcane farmers are suppressed by the sugar manufacturing company and the farmers don’t have any alternative or better deal for their sugarcane, unlike pineapple as you said. I think, one way of improving the management can be to sell the shares of the factory (may be in small amount) to the farmers so they feel the ownership and the profit of the juice factory can also be distributed to the farmers. So they will always keep the factory running for the profit. But this needs a lot of check and balance between farmers and manufacturers.